Are you familiar with dal makhani? 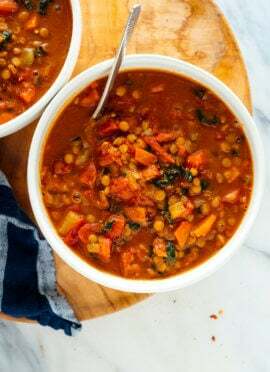 It’s a rich, spiced, lentil-based stew made for special occasions in India (especially in the Punjab region in northern India). Someday, I hope to travel there and taste it for myself. Maybe next year, if I’m lucky. For now, I’ll enjoy this dal makhani at home. 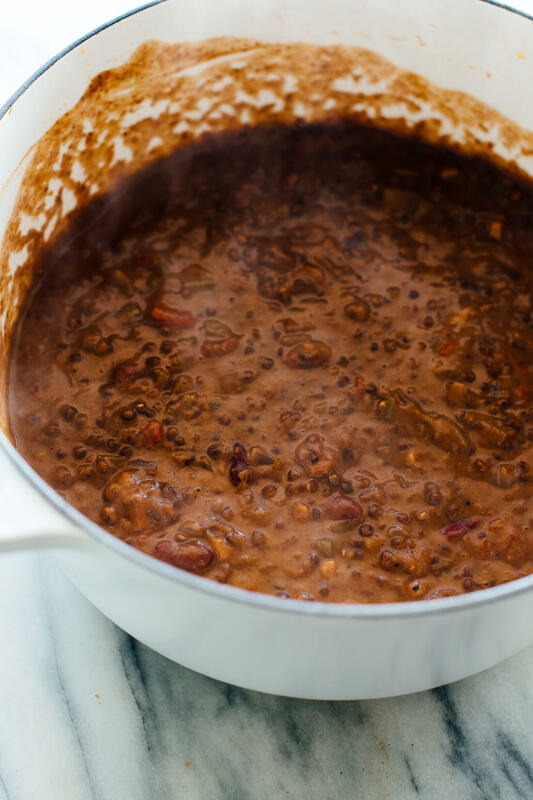 Dal makhani traditionally takes quite a long time to make, starting with soaking the lentils and then cooking them for hours on the stove (or more quickly in a pressure cooker). It’s often reserved for special occasions, like birthdays and holidays. I couldn’t find traditional whole black lentils (urad dal) in grocery stores, so I used regular black lentils instead, which cook much faster. I also used canned kidney beans rather than dried, so this dish only requires about 45 minutes on the stove. 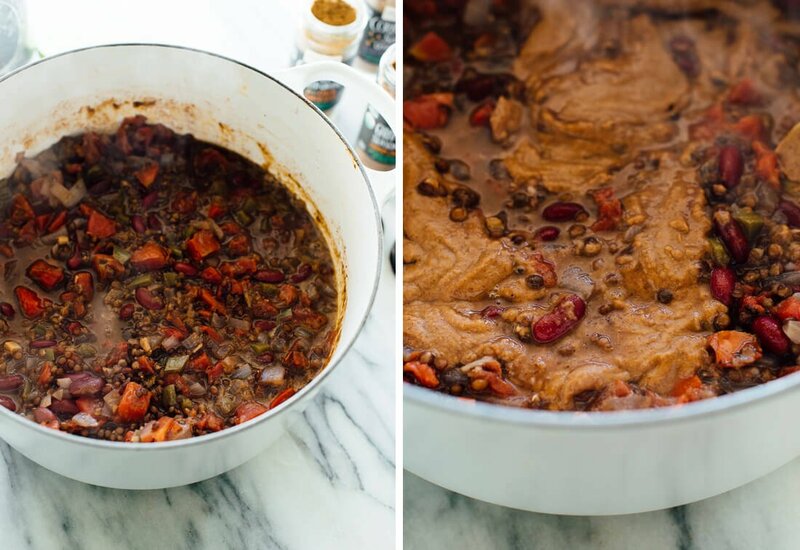 Dal makhani is generally made creamy with lots of butter and cream, but I stole a trick from my favorite lentil soup to make this creamy—I blended up about two cups of the cooked stew and stirred it back into the pot. The starchy lentils get nice and creamy that way. You’re welcome to stir in cream (or coconut milk) at the end, if you’d like, but it dulls the flavor a bit. If you order this dish at a restaurant, it will probably arrive with a beautiful swirl of cream on top. Since this dish is rich, the spices in this recipe are more subtle. Garam masala is a warming spice blend made with cardamom, cinnamon, cloves, cumin, black pepper and coriander. Indian cooking typically starts by dry-toasting whole spices, but I cheated and used a ground spice blend. Frontier Co-op’s blend smells and tastes so fresh that I don’t feel like I’m missing out. Great spices really do make a difference, and I feel so spoiled with a spice drawer full of Frontier products. Ground coriander (made from the seeds of the cilantro plant) and cumin liven up the dish, and a splash of lime at the end works wonders. If you’re craving a creamy, curried, satisfying stew, this is exactly that! 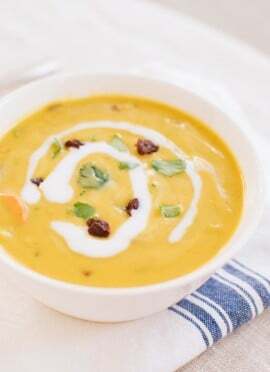 This dal makhani is rich, creamy and loaded with flavor. It’s also lighter and quicker to make than other recipes! Recipe yields 4 servings. In a large pot or Dutch oven over medium-high heat, warm the oil until shimmering. Add the onion, garlic, ginger and jalapeño, and cook until softened, stirring occasionally, about 4 to 6 minutes. Stir in the garam masala, cumin, coriander and salt. Season generously with black pepper. Cook, while stirring, for 1 minute. Add the tomatoes and cook for 1 more minute, while stirring. Add the lentils, kidney beans, water and bay leaf. Raise the heat to medium-high and bring the mixture to a simmer. Reduce the heat to medium-low and simmer until the lentils are nice and tender, stirring occasionally, about 35 minutes. Remove the bay leaf. Transfer 2 cups of the mixture (make sure to get some liquid with the lentils) to a blender. Securely fasten the lid. Blend until smooth, about 1 minute, being careful to avoid the hot steam rising from the blender lid. Transfer the blended mixture back to the pot and stir to combine. Add the lime juice and season to taste with salt (I usually add ½ teaspoon) and pepper. If you would like to temper the flavor and make the mixture even more creamy, stir in a splash of half-and-half or coconut milk, to taste. 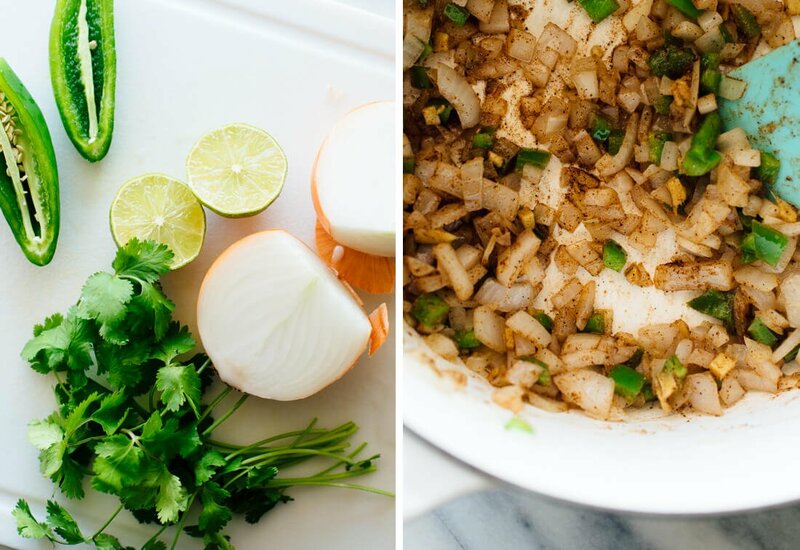 Serve in bowls, with chopped cilantro and a lime wedge on top. If desired, serve rice or naan on the side. Leftovers keep well, refrigerated, for up to 5 days. Make it dairy free/vegan: Use coconut milk instead of half-and-half, or use none at all. *Change it up: While untraditional, I also love this recipe with regular curry powder instead of garam masala. **Lentil note: This recipe is not designed for traditional urad dal (whole black gram lentils), which take forever to cook. Standard lentils (the brownish/greenish kind) will work in place of the black lentils. Just keep an eye on them, since they may be done cooking about 5 to 10 minutes sooner. I deeply appreciate your efforts to describe the history and different varieties of dal makhani alongside your own interpretation. It means a lot, especially when I’ve seen so many other food bloggers exhibit behavior that toes the line of cultural appropriation. This (among many other reasons) is why I love Cookie + Kate. Thank you so much, Roshni. I’m always trying to be respectful of traditional dishes as I present “my” version. I really appreciate your feedback! I’ve never tasted Dal Makhani myself, but I love Indian cuisine and in trying new food in general. I also happen to have a jar of garam masala lying around that has been begging for a new recipe! Thank you so much! I can’t wait to try this! Thanks, Kylie! This recipe is a perfect use for some of that garam masala. Hope you love it! There were no black lentils at the store, will green subsitute? Hi April, yes, they will work! This recipe was AMAZING!! thank you! This looks very cozy – looking forward to trying it! Thank you! Hope you love it, Breanne! Made this last night – it was so good! Most people say it was so good there were no leftovers. Well, we had a lot of leftovers (I think it makes more than 4 servings). But that’s great because now I get to eat it for lunch for the next few days. :) Thanks Kate! These recipes are helping me explore different spices and flavors in my cooking. This is so easy and good! I used regular brown lentils, didn’t puree any of it, and it turned out fine. Thanks, Danica! I’m so glad you enjoyed it. I wanted to cook something that didn’t require a trip to the grocery store, so I made this tonight. I previously found the black lentils at Whole foods. This came together quickly and was delish. Great recipe. I ate two servings and the house smelled wonderful from cooking it. Thank you, Tina! Delighted to hear that you enjoyed this one. Thank you for your comment and your star rating! My first adventure with cooking Indian food was the Tikka Masala in your book. My husband, daughter and I LOVED it. So I figured there was a good chance we’d like this too. I used extra-virgin olive oil, omitted any milk and the cilantro. It smelled wonderful and tasted amazing. I heated up leftovers tonight and served over rice with naan. Heather, so glad your family is enjoying my variations on Indian dishes! Thank you for letting me know! I love dal makhani and have been on an Indian kick lately! I’m back to no-processed food & vegan, so I was just looking for some healthy vegan Indian recipes. Can’t believe you just posted this. Definitely going to try this soon. Do you think I could use red lentils or green lentils (I already have them on hand)? Hi JG! I’m sorry for the delay. I think the green lentils will work. I just added a recipe note to make that more clear! I made this Dal recipe a few days ago and it is sooo.. delicious! My daughter at it for breakfast, lunch and dinner. SUCCESS!! I only made a few minor changes. I didn’t have kidney beans so I substituted black beans and I used a quart of chicken stock for added flavor. (I wonder how vegetable broth would task?) And, I left the seeds and ribs in on half of the jalapeno and added a 1/4 t. asafoetida (Indian spice). Thank you so much.. a new favorite! Donna, thank you! I’m so glad you enjoyed this one! This was really yummy and fairly quick and easy to make! I used vegetable broth rather than the water (1/2 carton- it was already opened in the fridge). I used Puy Lentils as I didn’t have/couldn’t find black lentils at my local stores. I will make it again thank you! Thank you, Yvonne! Delighted to hear it! I borrow that blending half of the ingredients to up the creaminess trick all the time!! I think I first came across it in one of your recipes:) Its the best. I love dal but am not familiar with this Punjab version. I have a close friend from the region but he is allergic to lentils, which he jokes makes him a bad Indian. Nonetheless, I am excited to give this a try. It looks so so hearty and rich. Haha, I like your friend’s sense of humor! I’m glad you appreciate that blending trick—it makes such a big difference sometimes! This is a fantastic recipe, I loved it as did my whole family.Thank you and keep them coming, you are an inspiration. This was wonderful! I couldn’t find black lentils, so used regular green lentils. Still so delicious. Filling and flavorful, like all of your recipes! Thanks for another great one. Thanks, Madeline! I’m glad to hear that regular lentils worked well. Hooray! I pretty much LOVE all Indian cuisine. 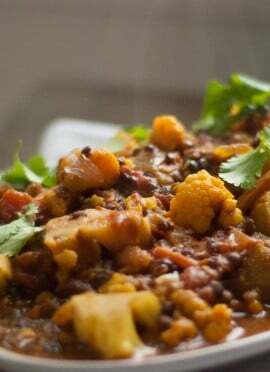 I am planning on making this tomorrow with black lentils (urad) I found at the Indian market. 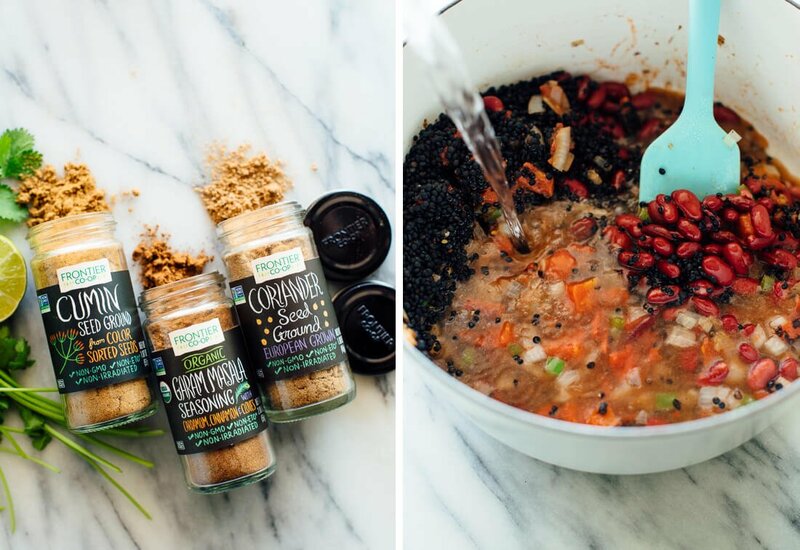 Question: Your cook time says 45 minutes using canned kidney beans…I am using canned as well, however, even the gal at the Indian market said that I should use a pressure cooker for the black lentils or else it would be a few hours to cook on the stove. Thoughts? I just made this tonight using the urad dal, and 35 minutes wasn’t nearly enough cooking time. Wish I had known. This is delicious! I added a small cinnamon stick and a bit of cardamom for some extra depth, and used some coconut milk for creaminess like you suggested. The leftovers are even better! I’ll be making a double batch next time. I have eaten a lot of Dal in my travels over the years and this is simple to make and has great flavors, it was a big hit. I made it and liked it so much I shared the recipe with some friends. I added some zucchini (large cubed), red bell peppers and fresh spinach at the end (I like my veggies crunchy) to make a complete meal. I was able to get the whole black lentils at my local coop. Mark, that is wonderful to hear! Thank you for your detailed feedback and review! You are so kind, Elise! I am happy you enjoyed it so much. If you would like to provide a star review, that would be great! This recipe was amaaaazing! Loved the tip of putting a little bit in the blender to make it creamy. Served w/ naan and rice and I cannot wait to make it again!! That’s great, April! Happy you enjoyed it and thank you for the review! Cooking this as I type! I could have sworn I had more than just red lentils in the pantry, but… I guess I’ll let you know how it turns out with red lentils. Ha. Enjoy, Devon! Let me know how it went for you. The lentils didn’t really hold up, but the flavor was on point so I didn’t mind. I think I’ll double the beans next time too. Great recipe! I made this for dinner tonight and it was AMAZING. It ended up not being quite flavorful enough, so I went back and added some more of the aromatics (it is entirely possible some of my spices were old). I also added a dash of cayenne to give it a little bit of heat. This was the most guilt-free comfort food I have ever had. Thanks, Kate! Thanks, Amanda for your review! You may be onto something with spices being to old with not getting as much flavor. Or, if they aren’t sealed all the way, I have found mine to loose some of their flavor. But I am happy it still worked out so well for you! I honestly was not expecting this to have enough spices, but the amounts were perfect. Regular coconut milk drizzled in at the end was a must. I plan to devour many hot bowls of this during our cold, rainy winter in Portland. Great to hear, Hannah! It is a great dish to have during cold days for sure. I appreciate the star review! hi kate, i’ve made this deliciousness twice now and it’s sooooo good. the last time was when my husband’s indian family came over for dinner and they all raved about it! they figured i had been cooking it all day long. the only adjustments i made was i soaked my lentils first and added a little extra spice. it’s a wonderful recipe that received high, high praise from my in-laws. i highly recommend it to anyone who loves dal. That is great! Thank you, Char for sharing. I just had one of those Mondays, where I’m screwing up left and right, traffic’s bad, the grocery store is crowded and … of course, I get home and in the middle of this recipe, realize that I forgot the kidney beans. Ugh! I was so excited to make this, so I soldiered on with a random can of chickpeas from the cupboard and I can say that even if with my last minute substitution that this recipe made all the bad parts of Monday disappear. Thanks for an easy, yummy, complex-tasting but easy-to-make dinner. If I could pull off a dinner this good after a day like this, you know it is a genius recipe! I am sorry you had a rough Monday, but happy the soup made it a little better :) Thank you so much for your comment and review! This turned out great. We are lucky enough to live in an ethnically diverse area, and have several Indian grocery stores nearby. So we used the correct type of lentils. If anyone has a Trader Joe’s nearby, check out their naan in the frozen section. I always get the garlic naan. It heats up beautifully and goes perfectly with this meal. So funny that you mentioned the Trader Joe’s garlic naan. I’m making this recipe right now and picked up some of the naan today. Can’t wait for it to be done cooking!! Gotta love Cookie & Kate and Trader Joe’s! 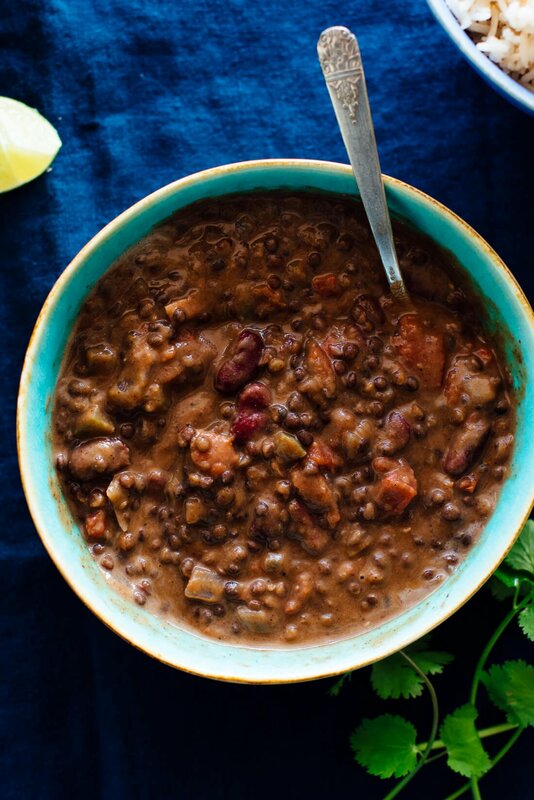 This dal has become one of my favorite recipes ever. It is absolutely delicious, I will have to double the recipe when I make it again in a few days. I didn’t have garam masala on hand so I used curry powder instead and used my immersion blender to make it creamy. Love this recipe!! Great! Thank you, Eleonore for your review. This is delicious and it was pretty simple to put together. I kept it basic and didn’t add cream, rice or bread this time around. I used my immersion blender in the soup pot and just pulsed it enough times to get some of the soup blended. It is a hearty soup! Made Kate’s broccoli salad as a side item with this soup for lunches this week – was very full!!! A great combination, Jennifer! Thanks for sharing how you made it your own and for your review. Just made this, and it’s soo good!! I love your technique of blending some of it to make it creamy…looking forward to making more of your delicious recipes! Thank you! I think blending really makes all the difference. If you would want to leave a star review since you liked it so much, that would be great! Kate, I recently went back to being a vegetarian. The only thing I eat that’s not from the earth are eggs (sometimes) and goat milk products (which are easily digested, high in protein and low in sugar than cow). I found your blog by chance and it is one of the most amazing rabbit holes I have ever fallen into. I adore your photography, recipes and the stories. They are very much like my own—inspired by travel and people. And, Cookie is adorable and needs to be on display more! Thank you so much. I hope FOOD NETWORK or NYT Cooking snaps you up soon. You’re an amazing talent. Well, thank you Anna! I really appreciate that. Cookie is precious (and she knows it too!). Yeah, a whole lime wold be a little too much. Let me know what you think when you make it again! Thank you for this recipe. It was good, but too watery IMHO. Next time I will try using only 4 cups of water. Made this recipe today! It was exactly what we were hoping for… a delicious dish that was healthier than the restaurant version of this dish. It was quick and easy to make. The only changes I made were I used some veggie broth along with the water and I used an immersion blender so my results weren’t quite as chunky as the posted photos. I served it with brown rice and naan. Oh, and I think it made more than 4 servings, more like 6. (We will have leftovers for lunch!) We will definitely make this again. Thanks for the great recipes- I am eager to try more of your dishes. Happy to hear that, Rachel! Thanks for commenting and review. Another amazing vegetarian dinner that won over my meat-loving family (even my 5yo who hates everything I cook on principle). I had to use plain brown lentils but will try it with black lentils next week when my order comes in. Homemade garlic naan rounded the whole meal out nicely. Thank you so much for providing such delicious meals that everyone can love! Hooray! That’s great, Meghan. Thanks for your review! how much coconut milk would u use here? Just a splash. 1/4 cup, more or less depending on the desired creaminess. Hope this helps! Let me start by saying I LOVE YOUR RECIPES!! I just took the plunge and bought a “InstaPot” (not the name brand, but a pressure cooker with all the bells and whistles at Bed Bath & Beyond). The only reason I chose to purchase it last night was because I love using their 20% off coupon and they do not carry the name brand InstaPot, but had one just as fancy-shmancy. So, anyways, I made my first dish last night…mac & cheese and the family loved it. 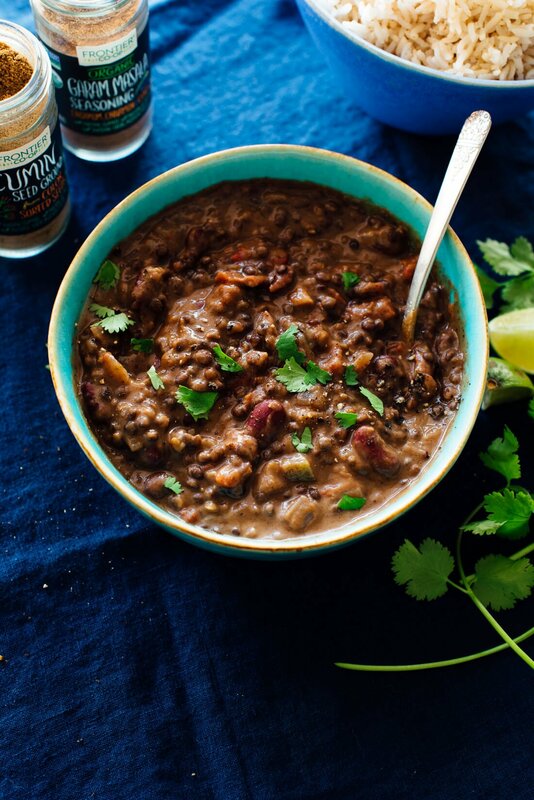 With ALL that background, I love using your Quick Dal Makhani recipe. How on earth do I convert to a pressure cooker?? Please help! Well, thank you Diana! I see you got it to work from your email. :) Thanks for sharing. This recipe is very mild. Next time I’ll add two jalapenos. Sure! Add additional spice, if you would like. The flavor was quite good, but using 5 cups of water made it very runny. It was a thin soup instead of a stew. If I make it again, I will use 2 or 3 cups of water. I’m sorry to heat that! Did you blend it? That should thicken it up. Or, it might have been the lentils you used. What type did you use? I did blend it. I used green lentils. I added a bit of rice to the leftovers to help absorb the liquid which worked well. We did like the flavor a lot. We love this recipe in our house (even the kids) and it’s now on regular rotation. The first time I made it I didn’t have a jalapeño or quite enough black lentils (I substituted 1/4 cup of red and used 4 cups of water). It was creamy and tasted delicious. I sometimes use all black lentils now, and sometimes still substitute some red. I use a jalapeño if I have one. It doesn’t really matter if I tinker a bit, it always tastes good. Easy to make, healthy comfort food with ingredients I have on hand. Thank you Kate for this fabulous recipe! You’re so welcome! I love that you are able to play around with this a little bit. Thanks for your review, Michelle! Well, hello Dawn! I’m glad you are making this now too. Thanks for sharing what you do differently! And yes, leftovers are so good. This recipe looks amazing and it’s on our meal plan for the week. Very good and very easy to make. Not quite the restaurant quality I was looking for but I will still make again. I’m glad you liked it, even though it wasn’t the quality you thought. What did you feel like was missing from making it restaurant quality in you opinion? Really interesting recipe! I’ve never seen it with jalepenos before. There’s no shortage of this in restaurants nor urad dal where I live, but I prefer homemade. I think fenugreek is in there. Also theres a charcoal brick done up at the end, don’t know if you’ve heard of that. The blending sounds super cool! I’m not dairy free but my daughter is, so I think she’d like to try that, although it’s usually pretty creamy anyway and I just put butter on the top at the end. This was great — I had a craving for this but didn’t have the funds to order it from my local Indian takeaway (waiting for paydayyyy). This satisfied my craving without taking too long (and probably a healthier version too to be honest!). I used a mix of green and red lentils as I didn’t have black to hand. And I added chilli powder as I didn’t have a fresh chilli in the fridge. I’m excited for you! Cravings are real, so I’m glad this one delivered! I had never used black lentils before (easily found at Whole Foods). This recipe was easy to pull together and delicious. The directions, as always, were crystal clear! And like another reader, I was glad to have a chance to use garam masala, a spice I purchased for a recipe a while back that I haven’t repeated. I’m glad you loved this recipe and you thought the instructions were helpful! This was easy and yummy. I reduced the water to 4 cups and cooked it in the pressure cooker on high for 15 min. Lentils were perfectly cooked. Needed additional salt (to my taste). Thanks for another great recipe. I’m glad you enjoyed it, Heidi! I had trouble finding black lentils in Vancouver Island, but strangely I found Urad Dal in Walmart. I had to purchase an 8lbs bag of them as that was all that was available. Then I had to rinse them, then soak them in hot water overnight, then cook them separately first. I had to adapt the recipe and not add the water, just the lentils and the water they were cooked in, just enough to cover them. Afte doing all that, I followed your recipe and the result is delicious! Thank you for another yummy and healthy recipe! I’m glad you found them! That’s a lot of lentils! I’m glad you loved the recipe, Colleen.